Human beings spend at least a third of their lives sleeping. It’s important to pay more attention and to make a conscious effort to create the best environment to get the best night sleep, as this got a huge impact on your physic and mental health. Investing time to create a good environment to sleep will be crucial to get a healthy amount of rest and recovering your energy levels. From mattress and bedding to temperature and light, every detail counts to make an awesome bedroom. In fact, the temperature is one of those important variables that can make a huge difference: a too hot or too cool bedroom can make your dream become a nightmare. Installing bedroom ceiling fans can be a key move to put together the perfect bedroom. 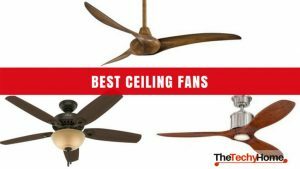 Keep reading, you’ll learn the advantages of having a ceiling fan, how to choose the best and which are the top-rated ones. The Harbor Breeze Mazon 44 is a flush mount ceiling fan that will look perfect in your bedroom. With a size of 44”, is suitable for a room up to 75 sq ft, its compact, elegant and sleek design will integrate seamlessly to your modern décor. Made with quality and durable materials, this ceiling fan is made to last. Controlled by a practical and simple handheld remote control, you’ll be able to select 3 speeds to maintain your comfort levels or use the reverse airflow feature for warm air distribution in winter. Its light kit is as tasteful, simple and energy efficient. It includes an 18 watt dimmable LED bulb. The airflow is pretty decent: up to 4545 CFM, more than enough to cover a medium room. If you’re looking for quality and reasonable priced bedroom ceiling fans, then the Westinghouse 7876400 is the one you need. This ceiling fan has it all: low price, sleek design, good motor, and a really nice performance; paired with a lifetime warranty on the motor and a two-year on all other parts is more than a dream come true. This ceiling fan is 42” is ideal for rooms up to 144 sq ft. The motor is a silicon steel one, will give you 3 speeds and reversible function. Its airflow is 4083 CFM and its efficiency (airflow per watt) is 80 CFM/Watt. Can be mounted on sloped or high ceilings with its downrod and is controlled by a classic pull cord. 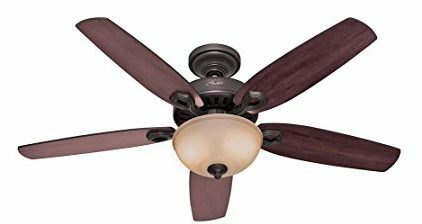 It’s the best bedroom ceiling fan that you can get for this price. The Westinghouse 7801665 Comet has been bought hundreds and hundreds of times. 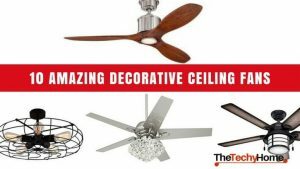 Maybe because of its reasonable price, nice size, great performance or gorgeous look, this ceiling fan is pretty popular. It has a 52” length that makes it the best ceiling fans for the master bedroom or those up to 225 square feet. Equipped with 5 reversible blades, this ceiling fan will be a nice and sleek addition to your decor. You can pick among 5 colors and finish options. Its light kit includes two 40 watt bulbs and a frosted glass cover. It’s really quiet, but the motor is powerful enough to give an airflow of 3589 CFM and an airflow efficiency of 63 CFM/watt. Thanks to its double mount option, its versatile enough to be installed in a lot of bedrooms, regardless of their characteristics. More than 600 people have bought these bedroom ceiling fans. The Hunter 53091 Builder Deluxe has a classic look, 5 blades and 52” that can cool a 225 sq ft bedroom. This has a patented and exclusive WhisperWind motor system that will guarantee a quiet performance, even in the highest speed of the 3 speeds or during the reverse function. It has a 5102 cfm Airflow and an efficiency of 76 cfm/watt. Hunter is a very well-known brand and its lifetime warranty is enough reason to buy it. People who have bought it says that its performance is just outstanding. It is easy to install and includes a balance kit to eliminate any wobble. This beauty can be running 24/7 during decades. 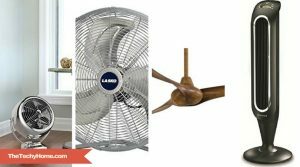 Hundreds of people can’t be wrong: this is a safe purchase and the best ceiling fans for a master bedroom. Room size can be a problem, if you live in a tiny bedroom you’ll find difficult to spot the perfect small ceiling fan, powerful and compact. Stop looking for, we have found it for you: The Westinghouse 7224300 Quince. This ceiling fan has this timeless design that could fit in almost any decor, without disrupting the design or hoarding too much visual room. With a length of just 24”, this indoor ceiling fan is ideal for room as big as 80 sq ft. It’s a silicon steel motor with a dual capacitor that delivers an airflow of 2039 cfm and an airflow efficiency of 67 cfm/watt. It has 3 speeds and a reversible function. Don’t be fooled by looks: this bedroom ceiling fan looks small but it’s powerful, stylish and efficient. It’s the best bedroom ceiling fan for tiny spaces. The Westinghouse 7216100 Solana is the pinnacle of a modern, sleek and minimal design, coupled with a reasonable price and sturdy construction. This ceiling fan has just two blades, and this has an impact on its looks but also makes it produce a cooler and stronger breeze. Take advantage of its 48” in a 144 sq ft bedroom. But don’t get too dazzled by the looks, The Solana has more than a pretty face. Its silicon steel motor offers 3 speeds, reversible switch and airflow of 4698 cfm and an airflow efficiency of 94 cfm/watt. Control it by a handheld remote and enjoy it with the trust that knowing that you’re backed by a lifetime motor warranty and a two-year warranty on all other parts. Quiet and easy to install, it’s all you need to complete your bedroom. Ceiling fans can be just too boring or serious for a kids room. This doesn’t mean that your kids can’t enjoy the advantages of having bedroom ceiling fans. Enter the Westinghouse 7247500 Roundabout. Bold colors, sturdy construction, quiet motor and nice look are more than enough reasons to get this fan for your kids’ bedroom. It’s just perfect because you can turn the blades when your kid grows up and as for a sober decorative style. We aren’t exaggerating, this is a Westinghouse, it’ll last decades and comes with a lifetime motor warranty. Don’t mind its compact design, it’s as powerful as charming. This ceiling fan is 30”, a great size to cool down rooms up to 100 sq ft. Its motor allows an airflow of 2483 cfm and an efficiency of 64 cfm/watt. Three speeds and a reverse function makes it suitable for all year round use. 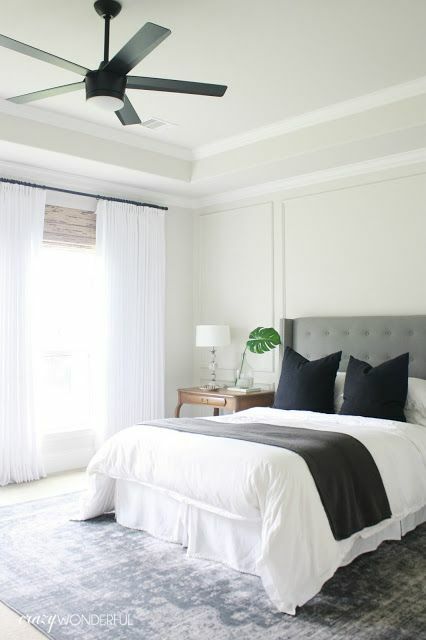 These bedroom ceiling fans are quiet, discrete and sleek; but overall really quiet. If you’re a light sleeper who can be disturbed by a needle falling on the floor, you’ll love the Hunter Anslee Flush-mount Ceiling Fan. Equipped with a WhisperWind motor, an exclusive design, this ceiling fan can deliver a powerful breeze with minimal almost-non existent noise. 46” blades are enough to cool down a 144 sq ft bedroom. Sturdy construction made to last. Its quality is simply outstanding and paired with a minimalist modern design, it will look perfect in a modern bedroom. Its installation can be a little bit tricky, but is worthwhile: you’ll be more than happy with your extra quiet and quality fan. When the budget is tight, you’ll have to take the basic-value option. Don’t worry, we’ve found a nice, cheap and basic alternative that you can buy to start enjoying the advantages of having a ceiling fan. The Hampton Bay Hugger is a decent alternative with its small price, quiet operation and maximum power. It has a 52” size, so it’s suitable for up to 300 sq ft bedroom. The flush mount installation makes it ideal for low ceilings. This ceiling fan is easy to install, could look nice in almost all decoration styles thanks to its simple design. It doesn’t have a super lifetime warranty, but it’s sturdy enough to last for some years. Ceiling fan size depends on the room size. You’ll need to know how big is your bedroom and where is going to be the fan. It’s important to choose the best size because efficiency and safety depend on this. Most bedrooms are up to 175 sq. ft. so a ceiling fan of 42 to 48” is enough. If your bedroom is up to 350 sq. ft., you could buy a 52 to 56” ceiling fan. If you have doubts between two sizes, remember: bigger is better. Airflow, expressed with the acronym CFM (cubic feet per minute) represents how many airs is moved for the blades, that cool breeze effect. The highest CFM, the better. The best ceiling fans for bedrooms are those with CFM higher to 4000 or 5000. The number of blades isn’t relevant to proper function, as it doesn’t affect efficiency or power. However, the more blades the ceiling fan has, the quieter will be. This makes it circulate less air, it could slow the motor. The number of blades is more of a stylistic decision than a practical one. Ceilings fans must be at least 8 feet above the floor in order to guarantee proper air distribution and safety. Metal ceiling fans must be higher, 10 feet. You should know the ceiling height in order to choose the best fan and to pick a longer downrod to adjust it if the ceiling is high. If your ceiling is low, you’ll have to choose a hugger o flush mount ceiling fan. Pay attention to your ceiling, if it has a slope, then you could need a special adapter to install your new ceiling fan. Modern ceiling fans can be pretty quiet but there’s always some low noise because of motor and electricity. Pay attention to noise levels, however, if you are a light sleeper a ceiling fan can be an improvement because that soft hum can act like white noise and block other sounds. You’ll find ceiling fans with different types of controls: remote controls, pull chains or wall-mounted controls. Think about your room distribution, bed position, and other particular details. Find the most comfortable for your needs. Some brands offer a lifetime warranty, while other ones offer different time to motor or parts. This can give you trust in that product. It’s better to pay a little more and get a quality product that can last for a lot of time. Bedroom ceiling fans can help to regulate your bedroom temperature, creating a cool breeze will dissipate the heat without lowering too much the temperature. On cold days, you can make it run clockwise to distribute the hot air. A ceiling fan can help to reduce your electricity bills up to 30%. Ceiling fans consume less energy, can make a room feel 6 to 8 degrees cooler on summer, while in winter you can make it run slowly, reversing the rotation. This would make the heat to redistribute on the room. Let’s be real: aesthetic is important. Sleeping and waking up in a pretty place, that suits your taste and personality can bring you even more happiness. Having all the advantages of a ceiling fan doesn’t have to mean having an eyesore in the middle of your room. There are a lot of options, colors, materials, and style to match your decor. 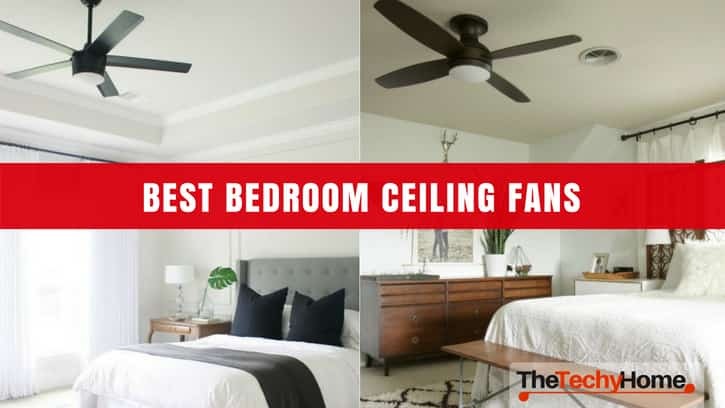 You’ll be able to find the best ceiling fans for bedrooms. Everyone knows how difficult is to fall sleep in a noisy place: car, neighbors, dogs can interrupt your sleep. The solution is simple: white noise. This random uniform noise, with a uniform frequency spectrum, can make your brain focus and let it ignore the noise outside. Modern ceiling fans are pretty quiet, but there’s still a hum that can be soothing and block the outside sounds.